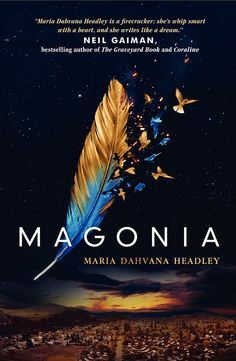 Magonia is an utterly unique, breathtaking and highly imaginative novel that I found myself engrossed in within chapters. Aza can’t breathe. Her disease is a mystery to every doctor and incurable. She’s going to die soon; she always knew it would happen. Things are getting worst though. It’s when all her hopes falter and she feels herself weaken to a very dangerously sensitive and raw state that she sees something spectacular amid the sky: ships that sail into the air! I’ll admit that before I picked up this book, I did not know too much about the premise. I had heard it compared to The Strange and Beautiful Sorrows of Ava Lavender which is said to be beautifully written, and the cover was gorgeous, so I was immediately taken by this book. Later, when I heard about the fantastical elements, I knew I had to read it immediately. It sounded exactly what I felt like. And it was. Magonia is one of the most unique and bizarre books I have ever read. It’s so incredibly rare that you find a book that blends genres this seamlessly without coming across as a rip off of another book. However while I found the writing captivating and the world utterly different from anything else I’ve ever read, I still had my issues. This book started out rather slow for me. As invested I was in the story, I did find it a bit odd that nothing particularly important was happening in the first 70ish pages. For me, it was typical sick lit (something that no longer particularly interests me). The writing was easy to read and engrossing though, so I didn’t give up, and by the time Magonia was introduced I was engrossed. The concept of a whole different world filled with ships in the sky absolutely blew me away. I had never read anything like it before. However as Aza began learning more about this mysterious place and who she really was, I found my interest wavering. I wanted so desperately to be glued to the pages of this book, however a few little things annoyed me too much to ignore. Aza was such a quirky character in the beginning. And while I really enjoyed reading about her as (for the lack of a better phrase) strong, independent woman in Magonia, I couldn’t quite wrap my head around how quickly she began dismissing her past. Although she thought often of her best friend Jason (who was a secondary narrator in this book), I felt that she moved on too quickly from everyone else in her life and that was unbelievable for me. And while the world was bizarre and beautiful and unique, there were a few elements of it that I did not completely understand. Mainly the singing. I didn’t feel that there was a full explanation as to how or why that was something Magonians could do, and I really would have loved to see the book a bit slower paced towards the middle/end and had the chance for more world building. The writing style though, like I already mentioned, was my favourite element of this book. It has everything I look for in fiction. And lyrical prose. Beautiful. Headley was also able to create the perfect atmosphere for each individual scene, something I find fantasy/magical writers often forget to do for individual scenes, and instead hope a single atmosphere works for the entire novel. In the end, all though I had a few issues with this book, I feel like this is a book almost anyone would enjoy reading. It’s so rare you find something this unique in YA fiction that I wouldn’t hesitate before recommending it to anyone interested in these genres. Definitely worth the read! Thank you 🙂 I definitely recommend giving it a go if you’re interested in the plot! I really did enjoy it, it just had a few moments that really got me annoyed. I doubt that’ll happen with everyone though!